In these pages, you can sample some of the delights of the Kith's glorious past! 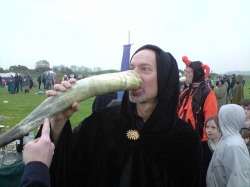 Rituals, raiments and rehearsals.... moots, mask-making and mead-quaffing..... excursions, efforts and excitements.... It's all here in.... THE ARCHIVE! Please contact this web page or the group if you would like anything else to be included in these pages. Thanks. 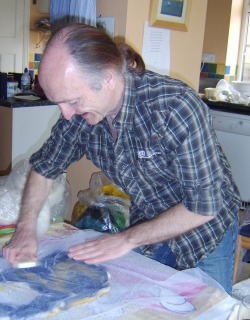 The "Kith in the Kitchen" workshops were open to Kith Members and laid the foundation stone for our current, similar get-togethers, which are now held as and when, in Members' homes. 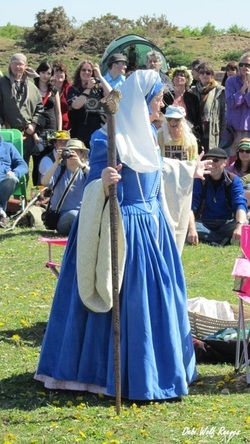 "Kith in the Kitchen", held in Nisey's home, included: Singing for Fun, Dream Workshop, Priesting and Priestessing: How to Facilitate a Ritual; Introduction to Tarot; Prop-Making for the Sacred Brigantia Players' plays at Thornborough Henge for Beltane; Clay- and Felt-making workshops; Oracles and Divination. 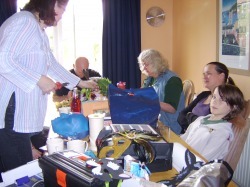 We have also had a Beginners' Astrology Course which branched off into a separate Astrology study group. Thanks to all those who have contributed their homes, time, tea, biccies, tables and energies! To make felt: take the wool of the merino sheep. This is laid horizontally on a template. Then a layer of wool is laid vertically. Next a horizontal layer, then a vertical layer. Complete 3 - 6 layers. 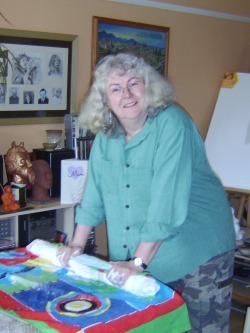 On top of the last layer, lay a patten or colours, or a picture in colours and strands. This is then covered with gauze, thoroughly wetted and soaped, and then rubbed, bashed, fuzzed, scrubbed and belted against a table until the felt becomes fuzzy and enmeshed. Colin is in the top photo, demonstrating. Beth is working that felt hard, pounding, rolling, smacking, and generally taking out a lifetime of frustrations on the poor, unsuspecting lump of wool. 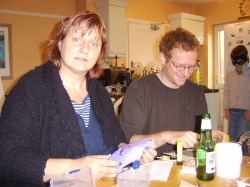 Nisey and Andy have all the materials needed to make masks - and a bottle of beer. 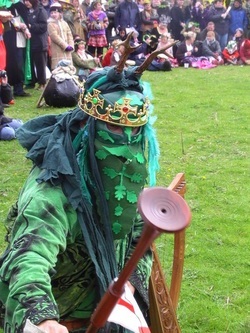 Notice the background leprechaun who has completed his mask in double-quick time ...as they do...! Making Lotions and Potions with Susie. 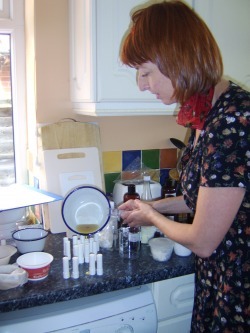 We tried out many different oils, fats and waxes, and learnt about the properties, benefits and purposes of each. Some are great for gliding over the body in massage, some are occlusive and sit on the surface of the skin, protecting it. Others sink swiftly into the skin and are no good for massage unless married up with a "long glide" oil, but contain Omega 9, 6 and 3. Essential Fatty Acids (Omega 3) are great for the skin, heart, nervous system and are anti-inflammatory. Then we walked round Nisey's garden identifying and learning about the uses of herbs for medicinal purposes. Nisey made the most delicious Moroccan Mint Tisane, which we drank. We made a Vitamin Body Cream, Lemon & Ginger Bath Foam/Shower Gel, Comfrey, Orange, Bergamot and Mandarin Shampoo, and a beeswax-cocoa butter-almond oil lipsalve. 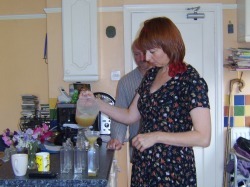 Nat and Marcus helped with stirring, bottle preparation and finding the elusive lids to the cream jars. The group looked on ...amazed! The lip salves are created from beeswax, almond oil, Vitamin E and form a protective but breatheable barrier on the lips, that also nurtures and feeds the lips' delicate skin. Shampoo this time. Natural herbal infusions, vegetal detergents and moisurising ingredients, finished with essential oils. 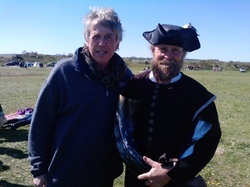 Members of the Kith of the Earthen Star and Phoenix Groups worked together and produced and performed the narrative play by Chrissie Haywood based on her research of the Pendle Witch Trials. 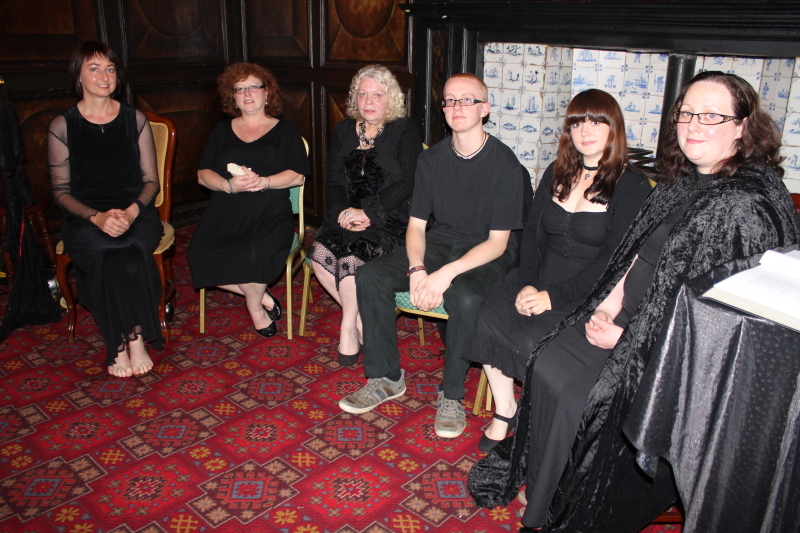 The drama honoured the 400th anniversary of the Pendle Witch Trials in Yorkshire. 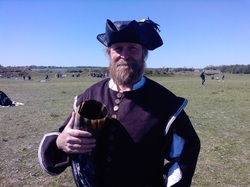 More information is available through Google or at www.pendlewitchtrials.co.uk. Photographs show the work in progress at the rehearsal stage. Chrissie researched and wrote The Pendle Witch Trials. Mary and Susie (above). Below: the Motley Crew, alias: "The Cast"! 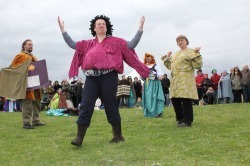 Marcus' magical Mystery Plays Cycle were written over a period of 9 years and have been performed, with energy and delight, at Beltane each year, at Thornborough Henge, North Yorkshire, and more recently at Sentry Circle, nearby. 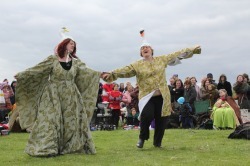 Helpers have included Fiona, Kat, Mary, Emma, Tom and countless others, with the props, puppets and scenery. 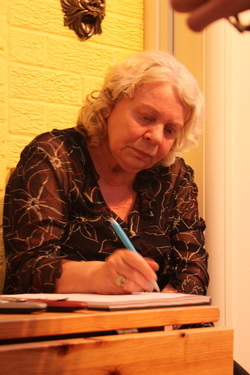 Susie and Jack wrote and performed the music along with Eve; Helen Browning the brilliant provider of costumes; Blayn, Maggie, Nat, Nisey, Andy, Colin, Anya, Sophia, and many others over the years have perfomed with gusto. Photos by S'ana Yates, Jack Firminger and many more; grateful thanks to all, and apologies to any whose names have been accidentally omitted. 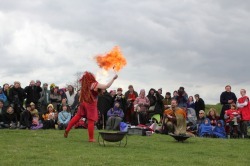 Facebook: Beltane at Thornborough, and: Beltane at Sentry. 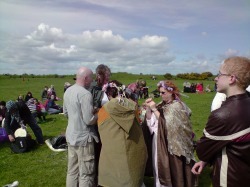 Beltane 2011: "Pryderi, The Prodigal Princeling!" 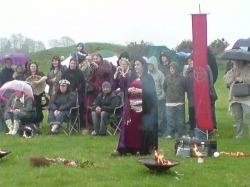 In these pictures we see Beltane 2011 at Thornborough Henge. After many strange practices, the Sacred Brigantia Players converge for an all-out dress rehearsal, that sets the play in stone, followed by various earthquakes and volcanos that turn the dress rehearsal on its head and hone it to "perfection"!! Not to mention the crisps, wine, olives and peanuts that accompany all operations. Roll on 2011.... The play is written and the rehearsals begin...!?! 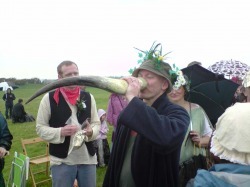 Marcus & Jack drinking from the horn of plenty! The drinking horn is reminiscent of past hunting days, Herne the hunter, and Cerunos pictured on the Gundstrop Cauldron. 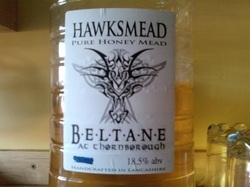 Mead is the alcoholic beverage made from honey, traditionally made in Lindisfarne. We create a circle of energy for safety and sacredness, then call in the elements of air, fire, water and earth. In this photo Fire is invoked. 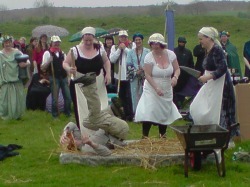 John Barleycorn is beaten to a pulp, by three wenches. 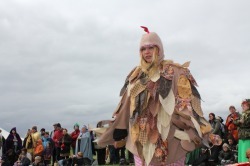 For the storyline, look up the story of John Barleycorn, a balled sung by many folk singers and groups, that tells the tale of the cycle of birth, growth, death and rebirh of plants, animals and humans. "Hail, Brigantia!" 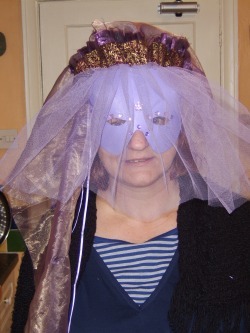 Eve enjoyed being a goddess for a day! 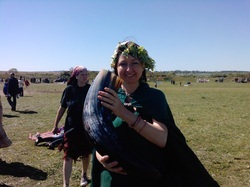 ​BELTANE 2010: THE DAY OF THE DADGA! 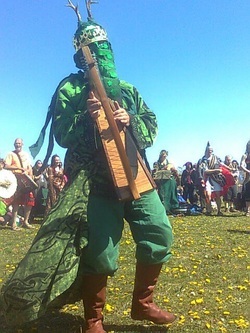 The Sacred Brigantia Players and Musicians took part in the latest play in Marcus' Beltane Mystery Play Cycle: "The Day of the Dagda". "Before I woz a laydee!" 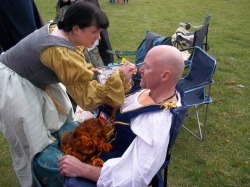 Marcus being made up expertly by Emma. ​"I'm a Lady!" Preparation is everything! Oliver's jokes get better as the years go on! 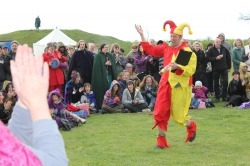 ​His Jester act has become a familiar and well-loved introduction to the annual Thornborough Henge Beltane festival. 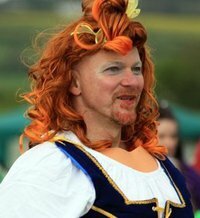 Yer gotta have a sense of humour if you're helping to organise a festival!?! 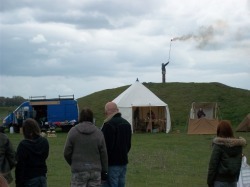 Steve lights the Beltane Fire, letting off fireworks on the perimeter banks of Thornborough Henge. 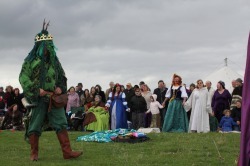 Sigbrit has been the yearly Green Man at Thornborough, taking us through our celebrations, opening ritual and later, clad in different garb, some handfastings. Calling in the Guardian Spirits of the South and Fire. Steph calls in South, Fire and blows Fire! The Day of The Dadga! The Story Begins! Cat swings into action with Nisey and Blayn close behind! "I am a Lady!" But it does not stop the magic water! Every year, 2007, 2008, 2009, 2011 poor old Marcus, soaked again with freezing water... and our Sophie, well, no male back-up this time! "So in love with you..."
Bound for the love nest on Mount Everest! "Where?" "Mount Everest, of course!" " Why?" " I don't know, don't ask stupid questions!" "I suppose it's as good a place as any." " ' Course it is, good old Mount Everest, I never got where I was today without roosting on Mount Everest!" 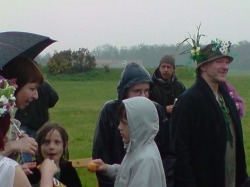 Tanya and Chris met at Beltane 2009 and were handfasted in 2010. Blessings to you both! 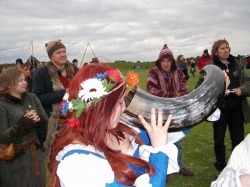 The art of drinking Mead from a Horn Of Plenty is to get it in your mouth, not up your nose! She's at it again... cannot leave the Mead Horn alone! 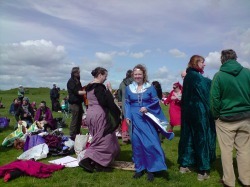 The Sacred Brigantia Players were honoured to become Bards of Thornborough Henge. Fire, the element of the South! Do not get on Steph's wrong side when she is in this fiery mood...! 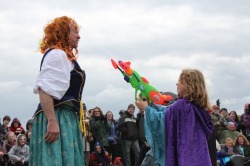 Steph blows the element of Fire, to welcome Brigantia, the Celtic Goddess of the Brigantes tribe, the main Celtic tribe of what we now know as Yorkshire. Branches of Hawthorn and a sphere of Yellow Calcite symbolised The North and The Earth. The Hawthorn was "paid for" with songs and grapes!!! (If we take, we give in return.) The Earth is vital all around us in stone, soil, grass, flowers, henge walls, and trees (Northern Henge). 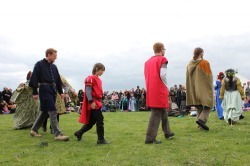 The Northern Henge can be seen from the Middle Henge where the Ceremony is held. 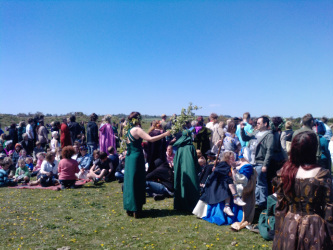 The Opening Ceremony of Beltane at Thornborough Henge each year. 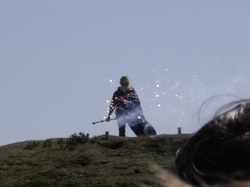 Steve lights the symbolic Beltane Fire to start the Beltane celebrations. 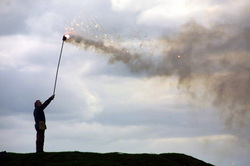 Hillside fires have always been popular and traditional Celtic ways of marking this festival of renewed life, and are still enjoyed today in traditional ceremonies.